A long time ago, programmers preferred sharing structured data in the form of XML files. However, in recent years, JSON has managed to replace XML as the most preferred data sharing format. Why? Well, compared to XML, JSON is not only easier to parse and generate, but also far more compact. But what if you want a format that is more compact than JSON? And what if you want it to be more easily readable? Then, you should consider using Google's Protocol Buffers. Protocol buffers are extremely compact, and can very efficiently handle large amounts of data. Using them is as easy as working with objects in your preferred programming language. 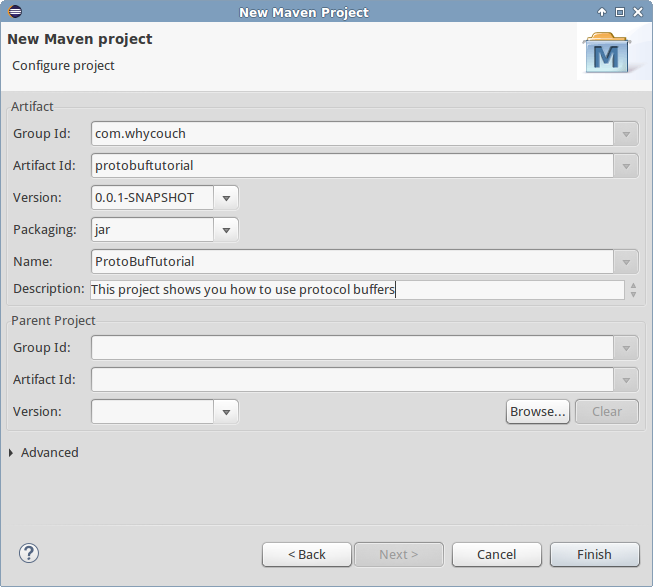 Fire up Eclipse and create a new Maven Project. Make sure you specify an appropriate Group Id and Artifact Id. 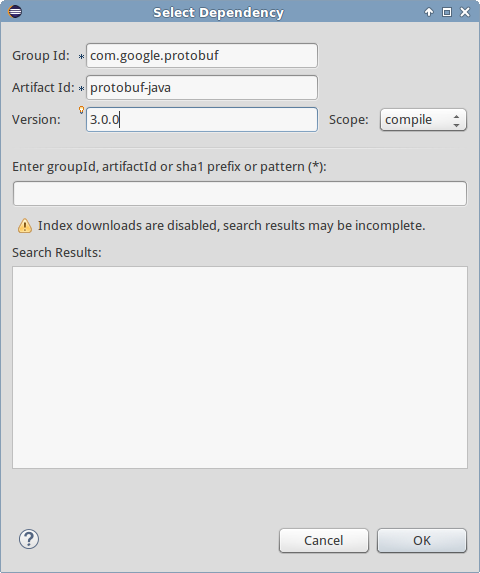 Next, open the pom.xml file and, in the dependencies tab, add a new dependency for protobuf-java. As you can see in the above code, we'll be using a class called Main that will be executed when we run this project. Therefore, add a new Java class called Main inside the src/main/java directory. I am using protobuftutorial as the package name. 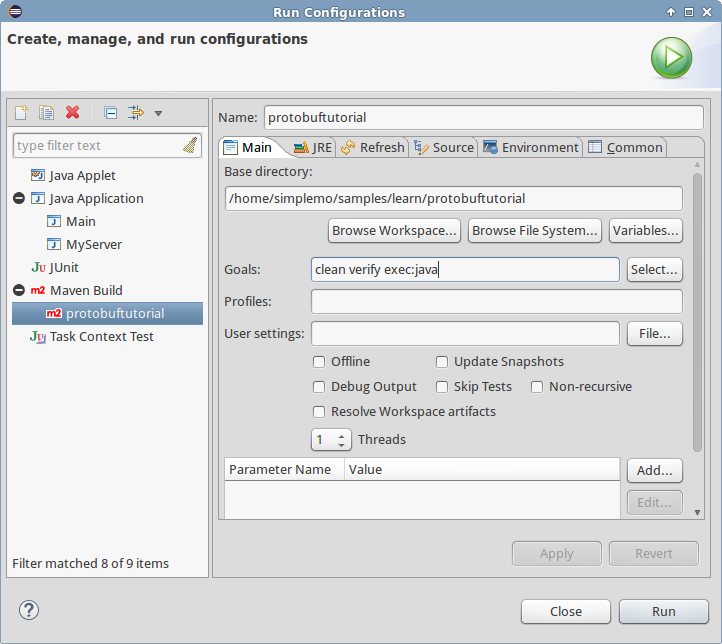 Next, open the Run Configurations dialog and set the Goals field to clean verify exec:java. At this point, our project is configured and ready. Protocol buffers need schemas, which are nothing but simple text files with the .proto extension. You can create these schemas inside the src/main/resources. For now, create just one file called country.proto. As you can see, in the first line we specify the syntax we will be using in the file. It can either be proto2 or proto3. Next, we specify the java package of our project. And then, the name of the Java class that should be generated. I am sure, the rest of the file looks intuitive to you. Nevertheless, note that to represent a list, you must prefix the data type with the repeated keyword. Every field in the message should have a unique tag associated with it. The number after the = sign represents the tag. Now that the proto file is ready, we need to compile it. In order to do that, you must download the protocol buffers compiler. The easiest way to get it is to download the binary from GitHub. Make sure you download the file appropriate for your operating system. For example, if you are using Ubuntu 64-bit, you would download protoc-3.0.0-linux-x86_64.zip. After the download is complete, extract the ZIP file. You'll see that it contains a file called protoc, which is nothing but the compiler. You can, if you want to, add protoc to your PATH variable. After the compilation, if you refresh your Maven project, you should see a new file called CountryProto.java in it. The CountryProto class allows you to create new Country objects. But first, you must create a Builder for the Country object. Using the Builder, you can set the values of all the fields in the Country object. You can write all the above code inside the Main class. Once you have set all the fields, call the build() method to generate the object. The Country object can now be stored and shared in a compact manner. For example, here's how you can store it in a file. All you need to do is pass a FileOutputStream to its writeTo() method. Reading from a protocol buffers file is just as easy. All you need to do is parse it using the appropriate parseFrom() method. You can then call various getters to fetch the values of the fields. And that's all there is to it. You now know how to use protocol buffers. I've created a GitHub repository for this tutorial. You can take a look at the full project there. If you found this tutorial useful, please do like it and share it. Everytime you take a selfie, or share a picture of a cute dog with your friends, you make use of a rather old file format called the Exchangeable image file format, or Exif for short. Exif itself is based on an even older file format called the Tagged Image File Format, or TIFF. These days, .jpg files, which use Exif, are so ubiquitious and so ordinary that no one really cares how they work or how they are created. This weekend, however, I decided to take a look at the insides of a JPEG file, and tried to extract Exif metadata from it using just Java--without depending on any libraries! I mean, what's the point of the exercise otherwise? I must say, JPEG files are really well structured and it is quite easy to extract information from them. Nevertheless, you must take steps to read the bytes in the right order because the same file can contain words represented in both little-endian and big-endian formats. Additionally, the file contains pointers to other locations inside it. Therefore, you are going to be finding yourself frequently moving back and forth inside the file. All JPEG files must start with 0xFFD8. These two bytes are often referred to as the Start of Image marker. The next 2 bytes can either be 0xFFE1 or 0xFFE0. If you see 0xFFE0, it means you are looking at a JFIF application marker--JFIF is, of course, short for JPEG File Interchange Format. If you see 0xFFE1, however, it means you've found the Exif application marker. Note that a file can have both the markers. Therefore, it is a good idea to scan all the bytes of the file looking for the sequence 0xFFE1. After the marker, the next two bytes specify the size of the associated segment. The next four bytes form the string Exif. The next two bytes are just zeroes. The next two bytes specify whether the Exif data structure follows the Intel format, also known as the little-endian format, or not. If they are 0x4949, it means it uses the Intel format. If they are 0x4D4D, it means it uses the big-endian format. From this point on, for the sake of readability, I'll stick to the little-endian format. If you are dealing with the big-endian format, simply reverse the order of the bytes. The next two bytes will be 0x2A00. The next four bytes specify the offset to the first Image File Directory, or IFD for short. The next two bytes specify the number of entries inside the directory. Each directory entry is always 12 bytes long. The first two bytes of the entry specify the type of the entry, often called the tag type. The next two bytes specify the data format of the entry. The next four bytes specify the number of components or characters. The last four bytes either contain the value of the tag, or an offset where the value of the tag can be found. Tag 0x010F specifies the manufacturer of the camera. Tag 0x0110 specifies the model of the camera. Tag 0x0131 specifies the software used on the photo. Tag 0x8298 contains copyright information. Tag 0x0132 contains a date string specifying when the photo was taken. For all of those tags, the data format is string, specified by the hex value 0x0002. With all this information, let's create a simple Java class that can extract the values of the five tags I listed above. As you can see, its constructor can take a filename. Additionally, I have a boolean to tell if the file uses the Intel format or not. I also have a read() method where I'll be reading the contents of the file. Inside the read() method, we'll use the RandomAccessFile class because we need to be able to move freely from one position to another inside the JPEG file. To read two bytes at once, we can use the readShort() method of the RandomAccessFile class. In the following code, you see how I check if the first two bytes are 0xFFD8, and then search for the Exif application marker, 0xFFE1. You can probably tell that it's not a terribly efficient search, but it's easy to understand and quite readable. We'll skip the next 8 bytes because we're not interested in the data size, the string "Exif", and the two bytes filled with zeroes. Then we check if the file uses the Intel format, and set the boolean class variable accordingly. You can skip the next two bytes, but I'll use them just to confirm if I've got the right byte order. We must now read the next 4 bytes using the readFully() method. Note that I am using a method called convert() to convert the bytes into the right byte order. Let's take a look at the convert() method now. As you can see in the code above, by simply using the ByteBuffer class, we can quickly change the order of the bytes and then convert the bytes into either a short, two bytes, or an int, 4 bytes. Let's get back to read() now. By fetching the next two bytes and passing them to the convert() method, we can determine the number of entries present in the IFD. And now we must create a resetPoint, a point where we can return to in the future. Its value is where the IFD started, that is 4 bytes back. To facilitate the storage of the offsets, lengths and tag types we'll be encountering inside each directory entry, let us create a simple class called DirectoryDataPointer. As you can see, the class has three variables, a constructor to initialize them, and getters and setters for all the variables. If you are using an IDE like Eclipse, you can quickly generate most of the code present in this class. Back inside the Reader class and its read() method, let's create an ArrayList for storing all the directory entries. At this point, we have a lot of information about the tags, but we still don't know their actual values. To fetch those values, we must go to the offsets we determined, and read bytes from there. The seek() and skipBytes() methods of the RandomAccessFile class make it really easy to do that. Now that we have read all the data, we must close the file and return from the read() method. I hope you now have a better understanding of how JPEG files store Exif data. If you found this tutorial useful, please share it with your friends.